To watch the film press the play arrow at the bottom left of the image above. Click on the box second from bottom right for a full screen view. From the moment this film starts rolling and you hear birdsong, you know Waterwalker is not a film just about canoeing. “So, the first white man arrives in North America, see, and he looks out over the land and he calls it a pristine, untouched wilderness”. Waterwalker is as much a meditation on man’s relationship with the land as a film about wilderness canoeing. Over the course of Waterwalker, Mason makes a solo journey along the shores of Lake Superior and up one of its tributaries. There is a good amount of practical know-how that can be gleaned from merely watching the film from this perspective – not only canoe skills but also camp craft. From my perspective, even more valuable are Mason’s philosophy and approach, which he shares and demonstrates throughout. Throughout Waterwalker, Bill Mason shares his philosophy and approach. For some, Waterwalker is a little slow, languid even. I think, however, that the film brilliantly slows you down to the pace of a journey such as the one Mason is making in the Waterwalker. Moreover, my impression is that this is deliberate. Mason travels at a natural pace, soaking up his surroundings, living in the moment. He stops to paint. He reflects. There are a number of wildlife encounters. When he pauses, you pause with him. When watching Waterwalker I feel as though I’m also re-living times, places and moods with Bill. For me, this is part of the magic of Waterwalker. Whether or not you are a paddler, you can’t help but be taken in by Bill Mason’s sheer joy at being out in the wilderness. That alone, keeps me coming back to this film. Let me know what you think of Waterwalker in the comments below. Are there particular sections of the film you like? Or a particular line spoken in the film that particularly resonates with you? Thank you for posting this Paul. Bill Mason is an icon here on Canada, particularly Ontario where his films were regular viewing in schools in the 70’s and 80’s. Thanks for reminding me. This is one of my favorite films as well: the philosophy, the skill and artistry with canoe and pallet knife, the scenery, encounters with life, and the pace, the wonderful pace of the film. It is a meditation. Thanks for sharing Paul. This is one of my absolute favourite films. Incredibly inspiring, it makes me want to jump in my canoe every time I see it. Bill’s philosophy on wilderness travel is timeless and flows through all of his films and writing. A wonderful man who’s work I’m sure will continue to inspire generations to seek a closer relationship with nature and the outdoors. Personally I love the bit where he gets dumped into the water, swims to shore then waits for the water to give him back his canoe and other equipment! His philosophy – I’m here, I’m safe, I can wait. I saw this years ago when it came out on the big screen here in Montreal. Loved every minute. I had a couple of correspondences with Bill before he passed away. Just a terrific fellow. Thanks for the reminder. Love the opening theme song too. It’s great that you have put Bill Mason’s “Waterwalker” on your blog for all to see. I first learned of Bill Mason years ago when we were teaching our Venturerer Group about paddling. In those days we borrowed 16mm film reels of Bill’s Path of the Paddle series from our local library. He became a hero of mine and I had the honour of corresponding with him a few times. I also had a chance to meet and chat with him at one of his presentation nights. He was a sweet man and he is sorely missed. Bill’s family are also wonderful people. I had occasion to write to his wife Joyce and children Paul and Becky once when I was starting a painting based on a two second storm scene in his film “Song of the Paddle”. I asked their permission to use this scene as reference, they graciously agreed. I promised not to show or sell the painting unless they approved of my efforts. They were very kind with their comments and gave me their blessings. Needless to say I was thrilled. The painting can be seen on my website. Although Waterwalker is my all time favourite movie, my favourite part of the film, I’d have to say it is the white water sequence because that’s the type of paddling I most enjoy. Besides, I’ve paddled many of the rapids shown in the sequence. 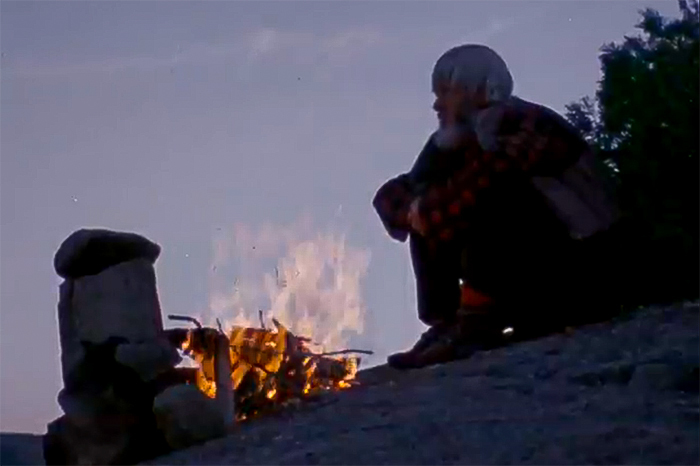 I always recommend this film to anyone who’s got an interest in backcountry canoeing. I enjoy you blog very much Paul. It’s always fun to see how other folks do things. Hi Paul, one of my favorite films. I have all of Bills books and videos, truly a great Canadian. When ever I need to relax I watch this film and just enjoy the magnificent scenery. I am truly blessed to live in Canada, absolutely stunning wilderness. My favorite part is when he is sitting in camp painting the waterfall, he was truly a great painter. I’ve never set foot in a canoe my whole life and I’d never heard of Bill Mason before either, but that was the best thing I have seen in a very long time, if not ever! I’m very grateful to Paul for bringing this wonderful film to my attention. Many of the quotations from the native people resonated with me and the film’s opening line is testament to their attitude to the world around them. The absence of that same voice today is also testament to the short-sighted, ignorant, disrespectful and downright destructive behaviours of our modern lifestyle. It seems a terrible thing to say anything negative in response to such a beautiful film, but I can’t help but grieve the loss of “pristine” places closer to where I live and my own lack of access to anything even approaching one. I’d trade any lifestyle, in a heartbeat, for one more akin to that depicted in this film. Thanks for sharing Paul. Great movie! I didn’t know Bill Mason so far but He is great; his way to stay close to nature is very important at these time. I’m not a paddler but the movie is very interesting under any aspects but above all is the approach. Because I think that everyone can get into the nature as merely visit it, but only someone have his approach: part of it! I really liked this film from start to finish and the parts of it when Bill seems to listen an Indian voice(my listen english is not very good, say bad, but I understand the sense of words). I agree with his way of live and I like when He remember that for Native People everythings around us,is flesh, . Also I agree that nature talks to us and we have to learn to listen. So Paul thank you very much to let me know that. His films are really inspirational. I especially enjoy his film on tandem whitewater paddling. When I have someone new to whitewater on a whitewater trip I always advise they watch this film, many times over! Another adventure writer that I really appreciate is Alan Kesselheim. Many people write books on their outdoor adventures that read like monologues. Alan brings his adventures alive. He also has a great little book on dehydrating food for trips which is my bible during trip prep. Alan has a book of short stories called Threading The Currents, and my favorite from that book is a story called Consequences. What a great film! Inspiring, mesmerizing, beautiful. I had to cringe though when he crumpled up his painting abd threw it in the fire lol. Thanks fot this Paul. I just love that film and the other two he made about paddling I love to paddle my self, hes daughter have a verry good movie about paddling. Other movie I would recommend is Tracks, Into the wild and the documentary with Les Hiddins The Bush Tucker Man. 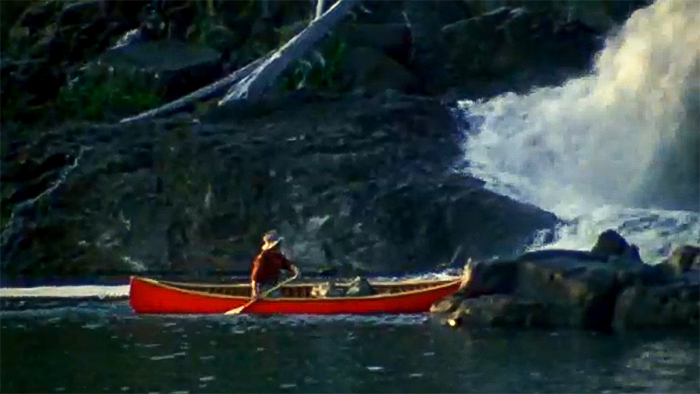 Just in case people are interested you can watch all of the Bill Mason canoe films (plus others he made) for free here on the National Film Board of Canada website. They are well worth a look! Bill is an icon in Canada. The movie’s opening line says much more though, “So, the first white man arrives in North America, see, and he looks out over the land and he calls it a pristine, untouched wilderness”. Bill continues to say, “That says a lot about the people who lived here before the white man arrived.” It’s from the Native Americans (Aboriginals, American Indians, call them what you will, my grandmother was full blooded Algonquin) that the canoe became known to the white man. Even our own prime Minister Pierre Elliot Trudeau has said, “Travel a thousand miles by train and you are a brute; pedal five hundred on a bicycle and you remain basically a bourgeois; paddle a hundred in a canoe and you are already a child of nature.” Canoes make you a part of nature, as much as bushcraft should. Canoes and Canada seem to be related. It’s an obvious privilege of our (Canadian) history. The Voyageurs, the Hudson Bay Company, and now yourself all enjoy the canoe as both a peaceful means of travel and natural aide, as well as an exhilarating and quite beautiful vehicle for whitewater. Just my annoying five pennies worth. I often wonder how different a place the Americas would have been had we just assimilated into the Native life. Listening to those guys and gals that had spent centuries learning the ways of the land and how to adapt after our long experience in Africa. We did all venture forth from there so our DNA tells us so far. I imagine a whole continent that isn’t covered in concrete jungles! I remember when I was 21 and Visiting New York for the first time. I was up one of those ridiculously tall towers and my friend said “look at the amazing view”. I looked out and thought this isn’t a view. Concrete as far as you could see and nature hammered out of any recognisable form into a wholly grotesque landscape. This film inspires me as there are so many people finding their way of living in tune with nature despite the odds. As he said it is being made more difficult for folk to be wild and embrace this kind of living closer to and with our beautiful planet.